I’ve been going on holidays to Cumbria since as far back as I can remember, but the week I spent there in March was quite different and absolutely wonderful. I’ve got family up in Cumbria so visits over Christmas, Easter and summer were quite common while I was growing up. Despite family ties near the Lake District, and countless kayaking trips, I’d never actually gone walking there. This holiday was a chance to actually go walking in the area, and spend some time with my mum before I leave home again. We drove up on the Sunday and instead of turning off the motorway to stay with family, we got off and found our booked Air BnB. This was my first experience of using the alternative accommodation option and it has to be said I’d highly recommend it! Our host was wonderful, very welcoming and was full of advice on local walks and attractions. She showed us to our rooms and a little tour of the house, before letting us get on with our evening. We headed down to the village pub for some good grub, and joined our host for some Sunday night TV later on. Going to bed later I met the house cat, who seemed to have taken a liking to me as he jumped out from under my bed and sat beside me. Despite coming from Wales, when I was younger we used to always joke about how the weather was terrible and it was always cold and wet up in Cumbria. We planned our week around the weather, which for the most part was fine but it promised to be the best weather on Wednesday. So we chose that day for a bigger walk, and fitted in other smaller walks and activities around it. Almost every day of the week we saw my auntie who would either take us out for a ride or join us for a walk. It was a week of walking, horse riding, drinking lots of tea and meeting a lot of old friends. The first walk was a wonderful local jaunt, straight out of the front door. Up out of the village we did a little loop to a nearby village and back round another way. We’d hoped to stop off in the other village for a drink, but the only pub there was closed. Saddened by this we carried on, but it all turned out to be a blessing in disguise. Better than a pub at 11 in the morning, we found that the tea shop at Dalemain was open so we enjoyed some lovely tea and scones. There are an endless amount of these types of small walks to do in the Lake District as so many of the small villages are connected by footpaths – look at any map of the place and you’re sure to find a walk between your village and another that you can turn in to a loop. We’d decided to stay in the northern part of the Lakes as there was so much to explore in that small area that we didn’t feel the need to drive all the way down to Scafell Pike or Windermere area. The beautiful consequence of this is that as the week went on, we saw the same place in different ways and could even spot the walks we’d done earlier in the week. On Tuesday our small walk up a hill from Askham brought us out on the small fell overlooking the top of Ullswater, and looking out we could see the local walk we’d done the previous day and pinpoint all the small villages. Wednesday was forecast for the best weather so we did a walk up Place Fell, next to Ullswater. We drove down to Glenridding and left the car there to get the Ullswater Steamer across the lake to Howtown, so that we could then walk back to the start. The first part of the walk was very busy as a lot of people had the same idea as us. We walked along the lakeside round a hill and through some woods. Then as most people continued the lakeside walk back to Glenridding, we started climbing up the fell. As we headed up the crowds died away, the views got better and we were the only ones around. We actually had to use the map to find the path as the higher up you got the less obvious it became which was much better than following a herd of walkers along a motorway path. 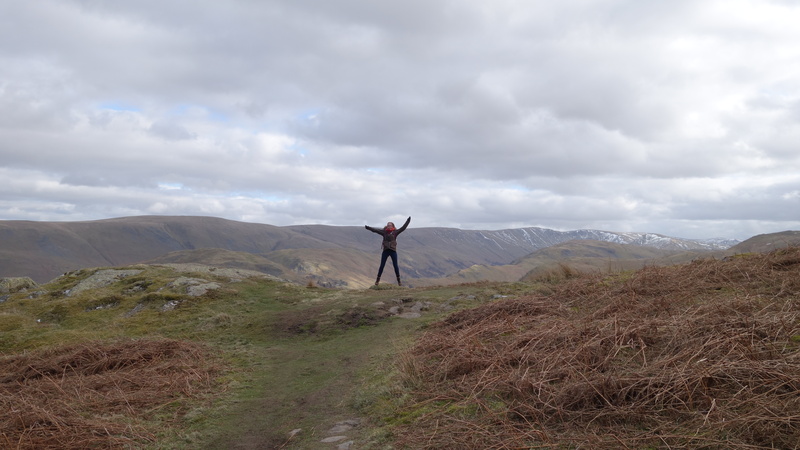 We continued to gain height and found our way to the top to be greeted with panoramic views of the surrounding area – Penrith, the Pennines, Ullswater and Helvellyn behind us. We didn’t stay too long as it was cold on top, so we set off back down the other side of the mountain. This side was completely different and unexpected as there was an actual path, even with stone steps in places. It was very steep and we were glad we didn’t come up this way – we enjoyed having to navigate our way up and not follow a path. This was probably the way most people come up Place Fell – straight up and and straight back down again. Finding a loop with a different ascent/descent without use of the ferry would make a very long day of walking. As we got to the last mile on the flat we were glad the walk was ending as we’d had a good day and didn’t want to walk much more. The pier was in sight, and we got a good laugh out of the small red car driving out of the car park with the boot wide open. As they stopped at the end of the road we thought they might have noticed, but they turned out and carried on driving. Hope they eventually realised! The rest of the week was more of the same; meals out with family, walks and horse riding. Walking up Gowbarrow Fell on Friday, we could see the entirety of the walk we’d done up Place Fell as it was the other side of the lake. The weather on Saturday was the only one to disappoint, but after a week of walks we were happy to go shopping and have a relaxing last day. We even stopped off in Carlisle to meet up with my pen pal – yes, an actual pen pal! An old family friend of my mum and grandpa who is an excellent painter. As he was a friend of my late grandpa’s we were curious about his age as he was still going strong. Turns out his birthday next month is on the same date as mine! It was wonderful to see him, and I promised that I’d send postcards more often as I’m a terrible pen pal to have – I’m of the generation where putting pen to paper isn’t quite as common as pushing a few buttons and pressing send. It was brilliant to explore a region that’s so familiar from a different perspective. It was like visiting somewhere anew and discovering places you’d never thought to visit when just visiting family. By staying in our own place, we had the freedom of our own timetable but could still see friends and family. Staying in someone’s house for a week is outstaying your welcome if they’re busy, so by staying all week elsewhere it meant we could see more people and fit in with their busy schedules.